A Flash Flood Watch continues for counties along the I-25 corridor until 6am MT Friday. At 10,000 feet above the ground winds are blowing out of the south. The stream of wind is blowing out of the south at 25-45mph. The southerly wind is acting as a conveyor belt transporting moisture from New Mexico and north central Mexico and moving it in to southern Colorado. 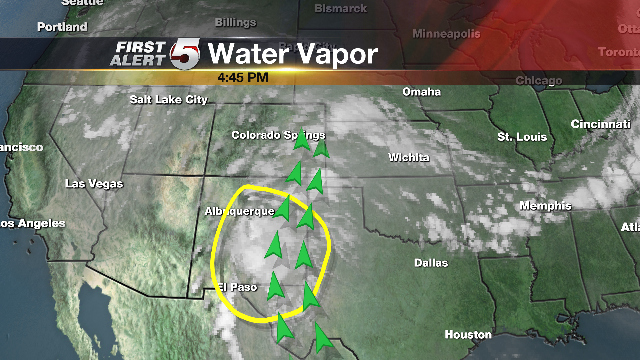 Water vapor imagery showing moisture located over New Mexico and Mexico. Green arrows indicate winds at 10,000 feet above sea level. With ample moisture in place, little waves of energy are moving in to Colorado from an upper-level low pressure system that is located over Nevada/Utah. The energy is helping to spark off showers and thunderstorms. Computer models project a couple waves of energy coming to southern Colorado later Thursday evening and again during the early morning hours Friday. Showers and thunderstorms are expected to develop and move north across the viewing area. Computer models continue to be bullish on rainfall numbers. Generally speaking, the models are projecting 1" to 3" of rain for portions of southern and southeastern Colorado through Friday morning. Some locations, in El Paso County, Pueblo County and Teller County could see 3" to 5" of rain with a few localized amounts 6"+ not out of the question. Overnight temperatures will only fall off to the 50°s and 60°s. Friday will see another chance for showers and thunderstorms although, they should not be as heavy as the rain Thursday night/Friday morning. However, with already saturated ground any additional rain could have flash flooding potential. High temperatures Friday will be in the 60°s and 70°s. Chances of rain will continue through the weekend but it appears southern Colorado should begin to dry out early next week.